Computed tomography (CT) urography has the highest diagnostic accuracy of the available imaging techniques. Epithelial “flat lesions” without mass effect or urothelial thickening are generally not visible with CT. The secondary sign of hydoronephrosis is associated with advanced disease and poor oncological outcome. The presence of enlarged lymph nodes is highly predictive of metastases in upper urinary tract urothelial carcinoma. 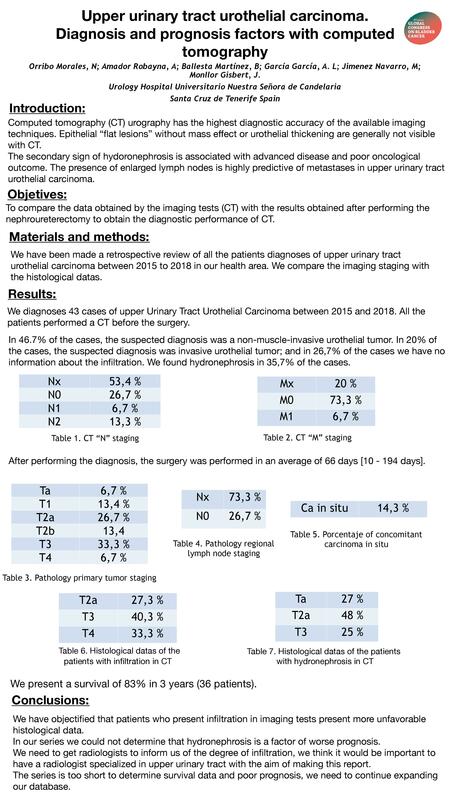 To compare the data obtained by the imaging tests (CT) with the results obtained after performing the nephroureterectomy to obtain the diagnostic performance of CT.
We have been made a retrospective review of all the patients diagnoses of upper urinary tract urothelial carcinoma between 2015 to 2018 in our health area. We compare the imaging staging with the histological datas. We diagnoses 43 cases of upper Urinary Tract Urothelial Carcinoma between 2015 and 2018. All the patients performed a CT before the surgery. In 46.7% of the cases, the suspected diagnosis was a non-muscle-invasive urothelial tumor. In 20% of the cases, the suspected diagnosis was invasive urothelial tumor; and in 26,7% of the cases we have no information about the infiltration. We found hydronephrosis in 35,7% of the cases. When we made the imaging staging we found 53,4% of Nx; 26,7% of N0; 6,7% of N1; 13,3 of N2; 20% of Mx; 73,3 % of M0 and 6,7% of M1. After performing the diagnosis, the surgery was performed in an average of 66 days [10 - 194 days]. After performing the laparoscopic radical nephroureterectomy in all the patients we found 6,7% of Ta; 13,4% of T1; 26,7% of T2a; 13,4% of T2b; 33,3% of T3 and 6,7% T4. In 26,7% of the cases we have N0 and the rest (73,3%) were Nx. In 14,3% of the cases concomitant carcinoma in situ was present. When we analyzed the histological datas of the patients with infiltration of CT we found 27,3% of T2a; 40,3% of T3 and 33,3% of T4. When we analyzed the histological datas of the patients with hydronephrosis in CT we found 27% of Ta; 48% of T2a and 25% of T3. We present a survival of 83% in 3 years (36 patients). We have objectified that patients who present infiltration in imaging tests present more unfavorable histological data. In our series we could not determine that hydronephrosis is a factor of worse prognosis. We need to get radiologists to inform us of the degree of infiltration, we think it would be important to have a radiologist specialized in upper urinary tract with the aim of making this report. The series is too short to determine survival data and poor prognosis, we need to continue expanding our database.